C7 - Altec Products Inc. Forget the stock flat look of most Rear Frames. 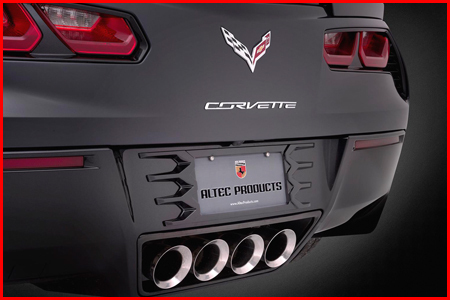 Altec’s New Curved Rear License Plate Frame mounts to a backing plate for a custom finished look. Specificallt designed for the C7 Corvette Stingray. Comes painted base coat, clear coat all OEM colors, Code 58U (Carbon Flash) is color used when matching lower factory finish.